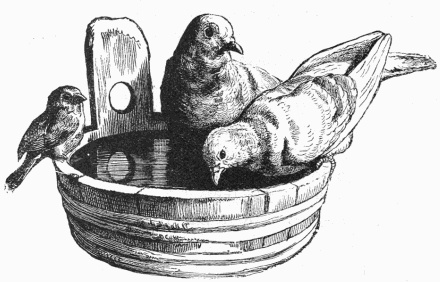 Sweet vintage drawing of a pair of doves and another little bird getting a drink. This black and white bird image is copyright free and in the public domain. This book was written by James Johonnot (1823-1888), who did not identify an illustrator for Friends in Feathers and Fur, and Other Neighbors. However, at least two of the drawings appear to be the work of Harrison Weir (1824-1906).